The Moroccan coast is largely steep to. Ports are conveniently spaced, making day sailing along the coast feasible. 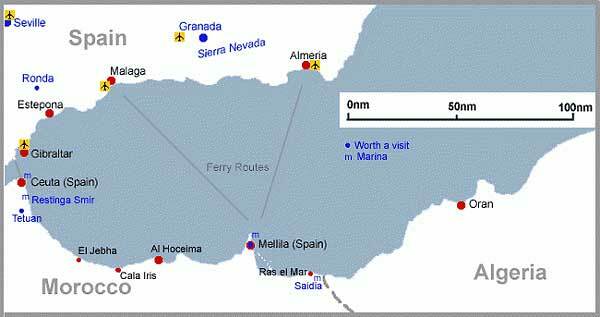 Two ports, Melilla and Ceuta, are Spanish enclaves, connected by regular ferries with Spain. Boats must book in and book out of Moroccan harbours for every passage. To anchor between ports, permission must be obtained beforehand, though there are not many suitable anchorages. Winds are predominantly westerly in winter, and NE sea breezes in summer. It is normal to offer "baksheesh" for services, even if they are not wanted!. Clothing which covers arms and legs is normal wear - shorts should be avoided. Ceuta. A Spanish port city and military base. Full service Marina Hercules is suitable for wintering ashore. Ferries to Algeciras. Tétouan is a city of some 300,000 population about 5nm inland of the coast. Its "medina" - the old city - is a world heritage site, well worth a visit. Take a taxi with guide, much better than coach trip. Port de M'diq lies about 10nm north on the coast, and may have berths. El Jeba and Cala Iris are small, rather isolated fishing ports of unknown quality and depths! Al Hoceima. Port of entry and town of 100,000 population. A tourist resort with a busy fishing harbour. Berthing for yachts available. Saïdia. Port of entry and large full service marina, set in a major holiday complex, suitable for wintering ashore or afloat. Good report on marina here.